With the financial crisis looming, Sophie becomes embroiled in a multi-billion-dollar merger that could make or break her career. The problem? Three men at the top of their game, each with very different reasons for advancing the merger. Now Sophie doesn’t know who to trust—or how far she’ll go to get ahead. After graduating from Yale in 2003, Laura Hemphill spent seven years on Wall Street, at Lehman Brothers, Credit Suisse, and hedge fund Dune Capital. She left finance to write Buying In. Her writing has appeared in Bloomberg Businessweek and on NewYorker.com. Laura lives with her husband and daughter in Manhattan, where she’s working on her second novel. Buying In rides the edge of being contemporary women’s fiction and falling into the recently coined category, “New Adult,” largely because the main Point of View character, Sophie is a recent college graduate on her first real job, struggling to swim in a high-stakes, high stress environment. While I’ve never worked in the same part of the financial industry Sophie has, I spent more than half my life in the real estate finance industry as a loan officer, loan processor, and underwriter, for local brokers and for corporate bankers, so I’ve had a taste of what was happening in 2007-09 – the period this book covers – during the great financial collapse. A lot of this novel gets bogged down by financial details that could cause the average reader’s eyes to glaze a bit, and some of the characters in the non-work areas of Sophie’s life feel a bit one-dimensional – SPOILER ALERT: she breaks up with her boyfriend, and because we barely know him, we don’t feel the impact we should – but overall, Buying In is readable, and I think the author has done really well with her first novel. Unlike Sophie, I had almost twenty years of industry experience when I saw the credit crisis coming, and I was smart enough to bail out when I had the chance. Sophie’s choices may not always have been ones I agree with, but they did make for interesting conflict, both within herself and with others, and by the novel’s somewhat abrupt ending, I had the sense that she would, ultimately, figure out who she was, and get what she wanted. Goes well with Chinese chicken salad eaten at one’s desk, and a bottle of water. This review is based on the NetGalley uncorrected proof of the novel, provided courtesy of TLC Book Tours. For the complete list of tour stops, click here. 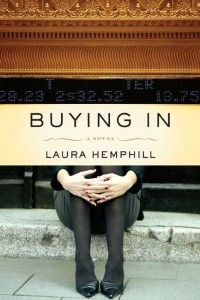 Review: Buying In by Laura Hemphill by Melissa Bartell is licensed under a Creative Commons Attribution-NonCommercial-ShareAlike 4.0 International License. I’m glad you made better choices than Sophie!